Australian stand-up comedian, political commentator, actor, and writer Jim Jefferies is one of the best known names in comedy on the planet. He will be bringing his latest major stand-up comedy tour, The Night Talker Tour, to the Teatro. Jefferies has firmly established himself as one of the most popular and respected comedians of his generation, with a controversial and belief-challenging stand-up style that continues to surprise and entertain audiences across the globe. 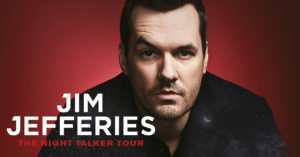 Don`t miss Jim Jefferies – the `Night Talker`. We don`t have to tell you, this tour will sell out! !